Margarita Codigo: Made with Codigo Rosa tequila, this is indeed a top shelf margarita. I enjoyed mine served on the rocks. If that doesn’t sound like your thing, I also tried their house frozen margarita, and it did not disappoint. 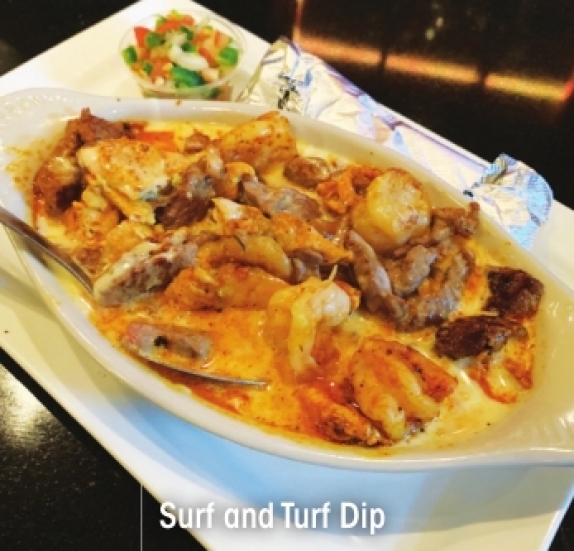 Surf and Turf Dip: If you’ve read my column with any regularity, you know I’m not a fan of seafood at all. But I am a fan of this dip. There is a generous serving of all kinds of meats, and it was very easy to move all the seafood to my date’s side of the dish. There were chicken, steak and shrimp, smothered in cheese and served with tortillas. 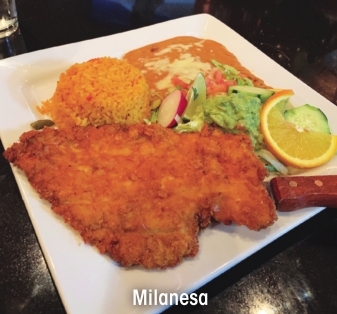 Milanesa: 10-ounce thinly sliced chicken, breaded and deep fried to golden brown, served with rice and beans, then mine was garnished with guacamole. It was incredible. It got even better once I poured some queso on top, as everything always does that you pour queso on top. 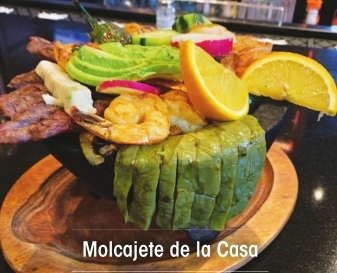 Molcajete de la Casa: Don’t ask me how to pronounce it, but I can tell you all about what comes in this giant Mexican stone bowl. Grilled chicken strips, steak, shrimp, bell peppers, onions and tomatoes, covered in tomatillo salsa and cheese sauce. This generous bowl of goodness is served with a guacamole salad, tortillas, rice and beans. Perfect for sharing on a date. 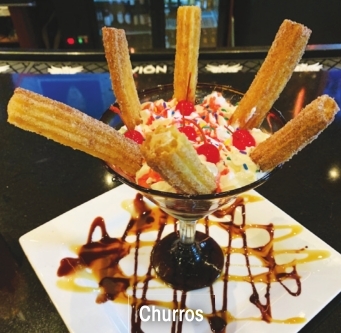 Churros: Served in a martini glass, a huge collection of churros towering skyward served with vanilla ice cream, whipped cream with a cherry on top. It was a cinnamon, crunchy delight. Enchiladas Supremas: Four (4!) enchiladas: Beef, chicken, cheese and bean, covered with enchilada sauce, tomato and sour cream. I’ve never tried a platter with four enchiladas, but challenge accepted. Steak Ranchero Special Platter: Diced grilled steak served on a bed of Spanish rice, sautéed bell peppers, onions, tomatoes, all topped with their special cheese sauce. If you loved the original Wine Country location, you will love it here. They kept the charm of the legendary bar area and made a cozy atmosphere elsewhere. They’ve upgraded the patio, too, so now that it’s the right weather, expect that outdoor dining space to be packed. 4-7 p.m., with margarita and beer specials every day. Sunday - Wednesday: 11 a.m. – 9:30 p.m. Thursday - Saturday: 11 a.m. – 10:30 p.m.